IFTN caught up with Niamh Heery and Caroline Kealy, last year’s Science on Screen award recipient, to find out more about their filmmaking experience ahead of the 2019 Science on Screen Information Day, which takes place this Friday April 5th. The Science on Screen initiative, which is currently accepting submissions for 2019, offers documentary filmmakers a chance to create a €35,000 26-minute documentary on the topic of PPI. PPI refers to Public and Patient Involvement, in which people who are likely to be affected by new treatments or programmes developed through research, are directly involved in planning and shaping decisions about the research. The documentary is funded by the Health Research Board’s Knowledge Exchange And Dissemination Scheme 2018 awarded to the HRB Primary Care Clinical Trials Network Ireland and supported by CÚRAM. Directed by Niamh Heery and produced by Caroline Kealy of Swansong Films, ‘A Tiny Spark’ examines the effect of cerebrovascular illness and stroke on people’s lives and specifically looks at research into the blood clots that cause stroke. With a mixture of dramatic first-person accounts and beautiful animation sequences by Eric Dolan highlighting the functions of the various parts of the brain, A Tiny Spark is a film about science’s ability to affect real change for human life. A Tiny Spark focuses on stroke and cerebrovascular research being led by Neuroscientist, Dr. Karen Doyle from CÚRAM and Galway Neuroscience Centre in NUI Galway, which involves analysis of removed blood clots to see what information they may yield. 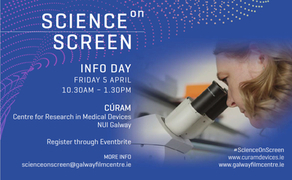 The Science on Screen Info Day for filmmakers will be held on Friday, April 5th in CÚRAM, NUI Galway. IFTN journalist Nathan Griffin caught up with Niamh and Caroline to find out more about their experience working with the initiative. IFTN: How and why did you decide to apply for the Science on Screen funding initiative? IFTN: Your documentary ‘A Tiny Spark’ is centred on ground-breaking Stroke Research being carried out in Ireland. Do you think film is an effective medium to educate the populous about important scientific issues? IFTN: Do you feel the use of film has enhanced awareness of the research being carried out and if so, why? IFTN: Do you imagine the partnership crafted between medical research and film could benefit other areas of science and if so, where?